Survey: Copy of 1984 survey. Mechanical: New CAC 2003, improved water main from street 2004, furnace 18 years, roof approx. 5 years old, windows 1997, small percentage of knob & tube. 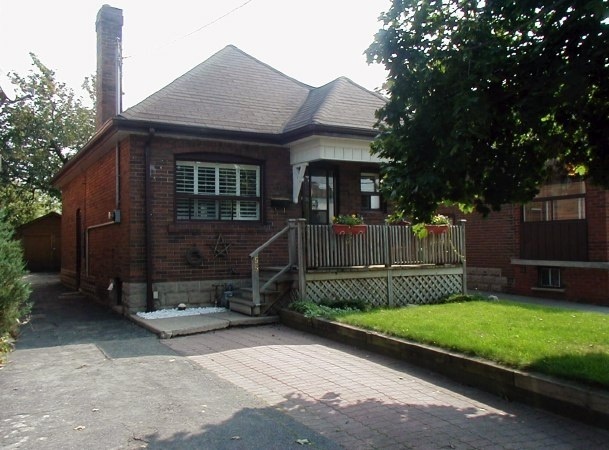 Located in the Fairbank district, this sunny home is situated close to Fairbank Memorial Park and Community Centre. Rolling hills and lots of green space add an old world charm to the neighbourhood. Shoppers in this area can choose from hundreds of stores along Eglinton Avenue West, including fashion boutiques, jewellery stores, and multicultural restaurants. Dufferin Street offers local shops and shopping plazas with chain stores. A short bus ride to Eglinton West subway station on the Yonge/University/Spadina line, with frequent bus service on Oakwood and Dufferin Sts. connect to stations on the Bloor line. Motorists gain quick access to the core via Dufferin St., and the Allen expressway is only five minutes away for quick getaways. 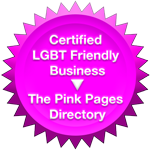 Safe, quiet community feel. Neighbours are friendly and helpful. 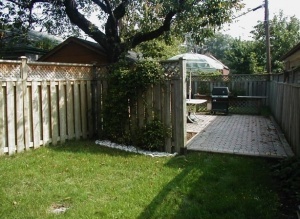 Large yard, suitable for a dog, family life & a vegetable garden is completely fenced all the way around. The separate patio area features an interlocking brick path. There is a mutual drive with a legal front pad parking with interlocking brick. 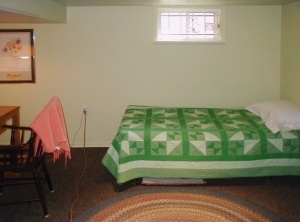 Interior is very bright, airy and open. The two main floor bedrooms have been converted into a large living room with gleaming hardwood floors and built-in bookcases. It is easy to convert back. 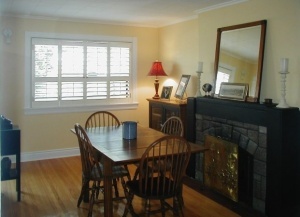 The sunny dining room has a lovely bay window and crown mouldings, a cozy stone fireplace and shining hardwood floors. 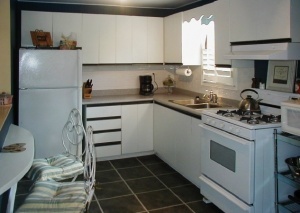 The eat-in kitchen includes a breakfast bar open to the dining room, as well as a double stainless steel sink, halogen lighting and new floors. 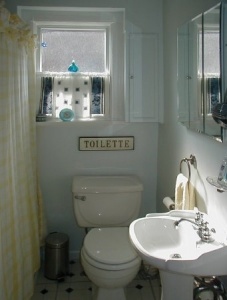 Other recent improvements include a new counter, faucets & backsplash. 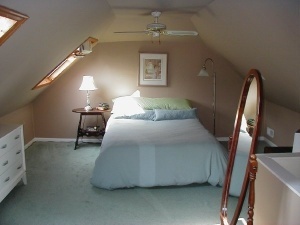 The master bedroom in the loft is a delightfully spacious retreat. 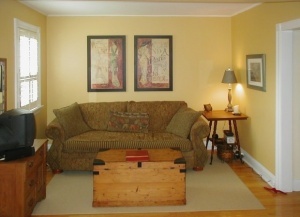 Light pours in the three large windows set in the sloped ceiling to illuminate this special room. 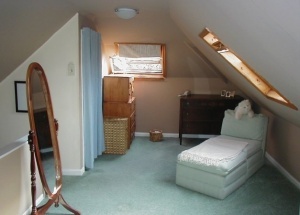 Features plush broadloom & a closet. 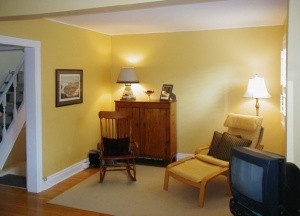 The potential basement apartment/in-law suite is accessed via a separate side entrance. 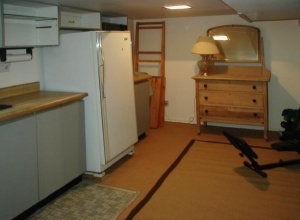 Finishes include a kitchen, 3-pc bath, and bedroom. 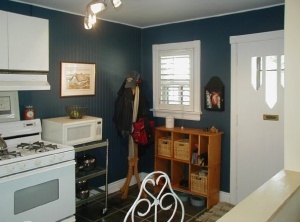 This level also features a workshop and laundry room separate from the living area.